Here ye, here ye! 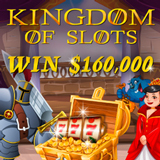 This month citizens of the Kingdom of Slots will take home $160,000 in prizes at Jackpot Capital Casino! Every Monday during the Kingdom of Slots casino bonus event, 200 frequent players will receive bonuses of up to $800 each. And with random draws awarding another $30,000 in prizes, even occasional players can win. Earn points as you play real money casino games at Jackpot Capital in the online casino or in the mobile casino and receive bonuses based on your points level. Kingdom of Slots casino bonuses reward frequent players and occasional players. Kingdom of Slots casino bonuses continue until October 9th. Players can check their current scoreboard ranking anytime at http://promotions.jackpotcapital.eu/kingdomofslots where contest details are also available. Jackpot Capital Casino offers hundreds of games from Realtime Gaming and is known all over the world for its excellent customer service and generous casino bonuses.